Today we pass on our top 8 Christmas present wrapping tips. These tips are useful for both novices & pro gift wrappers so there is something for everyone here! By picking a colour theme, the recipients of the gifts will be able to tell who the gift is from, especially if youre having a big family Christmas get together. Plus when all your gifts are nicely wrapped they’ll look pretty impressive! 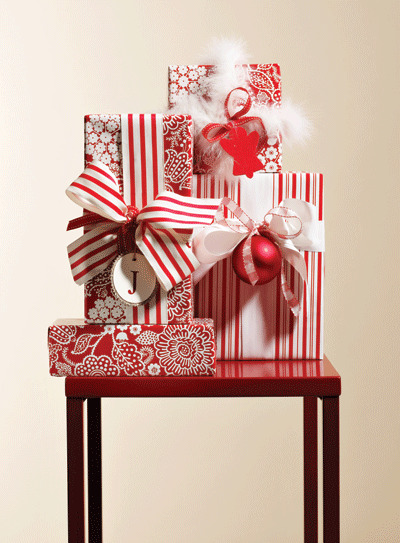 Avoid wasting cuts of wrapping paper and ribbon and always measure how much you’ll need. I’m not talking about precise measurements, but just approximates if you have a little bit of excess that’s fine! I’ve just picked this tip up  I never thought about using double sided sticky tape, I’ve always only used single sided sticky tape for all my presents. But use double sided for a more professional look, plus it’ll look like you’ve magically wrapped the present up. Presentation is everything, ensuring that the corners are neatly folded around the corners of the present shows that you did spend time and effort on the present. Plus it simply looks better. which is applicable to me. Either cut off an extra chunk of wrapping paper to hide the gap between the join or if it’s only a small gap, cut out a circle and place it over the gap that way it’ll just look like a seal. Pretty fancy huh? Before any wrapping commences, make sure you have all the bits and bobs to make your wrapping a success, this would include: Scissors, sticky tape, gift tags and wrapping paper. That way youre not having to find everything when you’re halfway through wrapping. It is indeed! Presents don’t need to be completely covered in bows and ribbons (it’ll make it look tacky)  something as simple as a single ribbon running around it will be fine. Simplicity is the best policy! And there you have it, our top 8 Christmas present wrapping tips. What about you? Have you got any tips of your own? Let us know on Facebook or Twitter, we’d love to see some pics!